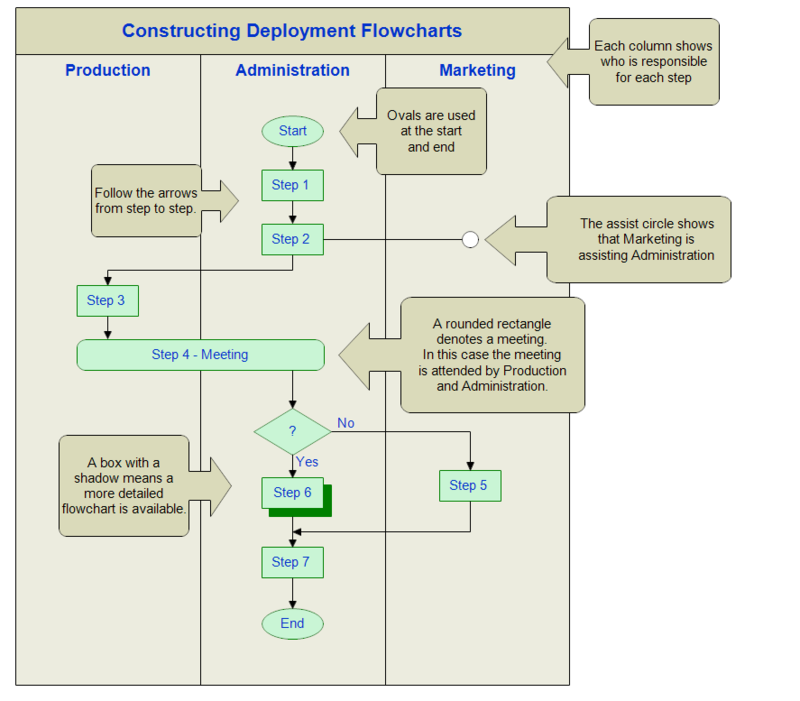 Deployment flowcharts show the steps in a process and also show which person or group is involved in each step. This example shows instructions for drawing a deployment flowchart with the responsible groups listed across the top. These groups are Production, Administration, and Marketing. You could draw a deployment flowchart that lists people instead of groups. The benefit of a deployment flowchart is that it shows where work is handed from one person or group to another. These are the places where misunderstandings and errors often occur. The shapes used in drawing a deployment flowchart are the same as those in a standard flowchart with a few of additions. The assist circle is a white circle in a column. It means that assistance is provided by that column. For example, in the chart above, Marketing assists with step 2. If you are providing assistance, you are helping out, but not in charge. A rectangle with a shadow indicates that there exists a more detailed flowchart for this step. Meetings are denoted by using in a rounded box. The box would extend across all the columns that took part in the meeting or be listed in each column. When two lines cross, you can use a bridge to show that there is no intersection. Usually when lines cross, the control flow continues straight along the line so bridges are often not used. Once RFFlow is installed, you can open the above chart in RFFlow by clicking on deployment_flowchart.flo. From there you can zoom in, edit, and print this sample chart. It is often easier to modify an existing chart than to draw it from scratch. Click the Deployment (Functional) stencil and then click the Add Stencil button.